Sen. Evan Bayh will not seek a third term, giving Republicans a prime pick-up opportunity in Indiana. (CNN) - Sen. Evan Bayh, D-Indiana, announced Monday afternoon that he will not seek a third term in the Senate - a major blow to Democrats worried about losses in the looming midterm elections. "Congress is not operating as it should," Bayh said at a news conference in Indianapolis. There is too much partisanship and "the people's business is not getting done." Bayh, a former two-term governor, was first elected to the Senate in 1998, taking 62 percent of the vote. He won re-election with 64 percent six years later. Bayh is the third Democratic senator to announce he is retiring when the curtain drops on the 111th Congress. Sens. Chris Dodd of Connecticut and Byron Dorgan of North Dakota previously announced they would not seek re-election. Meanwhile, Republicans will be forced to defend six seats in the midterm elections. Sens. Judd Gregg of New Hampshire, Kit Bond of Missouri, Jim Bunning of Kentucky, George Voinovich of Ohio and Sam Brownback of Kansas are all retiring at the end of the year. Sen. George LeMieux of Florida - who was named to replace Sen. Mel Martinez, who resigned before the end of his term - also will vacate his seat. One source said Bayh could consider another bid for Indiana governor. But he "hates the Senate (and) hates the left bloggers," said a friend of the senator who has also served as a longtime adviser. "They are getting their wish (of) pure Democrats in the minority." A Democratic Party source told CNN that Bayh's announcement took national Democrats by surprise. The source added that Democratic Reps. Baron Hill and Brad Ellsworth and Evansville Mayor Jonathan Weinzapfel may all consider making bids for the Democratic Senate nomination. 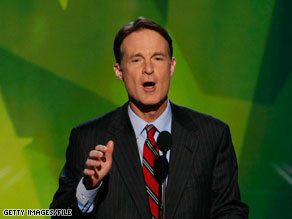 Bayh, a centrist Democrat, was considered a possible running mate for Obama in 2008. Bayh's father, Birch, served three terms in Senate. - CNN's Mark Preston, Gloria Borger, John King, Paul Steinhauser, Alan Silverleib and Candy Crowley contributed to this report. President Obama's blazing charisma and political slickness has not been enough to bring him a successful presidency. If leaders of the Democratic Party are thoughtful, they may take the exit of Senator Bayh as a cue to invite the President not to seek a second term for the good of the party. Then Democrats could return to more reasonable positions. It seems like the majority of posters here don't realize that Bayh is a Democrat, not a republican. A sad day. The ones who should be leaving are Harry Reid and Mitch McConnell! Leaders step forward to build coalitions; bridge difference; and accomplish good. They don't hide behind microphones and worn out ideologies. The news gets even worse for you. If you do not renew the Bush tax cuts that are set to expire in 2011, you will be raising the income taxes of Americans at nearly all income levels. Since the Democrats are the party in power (for now), guess who is going to get the blame for raising everyone's taxes? Hint: The Republicans will not get blamed for it. Try running on that platform in 2010. Of course Congress isn't doing the people's business or operating as it should. The GOP is acting like spoiled children and not doing their job. They're the ones not trying to work with the Democrats, not the other way around. The president has tried time and again to bring a bipartisan Congress to work on Capitol Hill, but the GOP refuse. It's their fault. Get rid of the GOP. America and the world would be a much better place. Buh-bye, Blue Dog Conservadem. Yeah, quitting is a great way to "work for the people." I'm sure he'll go run a PAC or something. The wheat being separated from the chaff, that's all it is. I wonder how much of his decision to not seek relection has to do with strong Republican challengers Pence and Hostettler? Bayh is too conservative to be a Democrat and too liberal to be a Republican. Voters generally don't like politicians who sit on the fence. Just wondering! Ha Ha it's looking better and better for America, the more of the democrap loons that quit now the better. so many comments on him giving up and running, etc. is a testament to the sad, sad state our country is in now. The man has realized that National politics is a joke littered with hallucinogenic induced, crazed leftists and insane, zionist rightists. Making the choice to leave the national circuit and returning home to try and make a difference is admirable. The only way to save America from this debacle is to evolve past the two party system and move to a multi-party system, with two or three moderate parties to take away power from the extremist nature of the DNC and GOP. It is wrong to think that as multi-faceted as the american people are, they can fit into one of two and only two molds. This type of schism is what led to the American Civil War in the 19th Century, and will lead to another one sooner than you might think. And it is naive to think that other nations would stay out of it like they did in the past. No kidding our business isn't getting done. Since the GOP doesn't want to contribute, how can anything get done> I here people say that the dems have a super majority. Well, yes, but since the GOP now insists on every vote to be passed by 60, instead of the normal 51, nothing can get done. They vote NO even on the bills they write if Obama says he supports them. How does that make sense? The GOP rails against the recovery act, but loves the photo opts when they hand funds out in there own districts. The senate is broken, the GOP needs to grow up and expect they lost the election and now need to act like adults. The USA has real issues. We need health care reform, we need more modern infrastructure that is of the 21st century, not the 19th. We need our banking industry to have laws and regulations again so they do not play games with the money we entrust to them. A spineless weak kneed tuck-tail and run Blue Dog. Good riddance.!! Well I will be sorry to see Evan Bayh go, he is one of the very few in the congress who actually tries to get work done for the people of this country, as opposed to his own political party and himself. Too bad the congress is not made of up of many more like him so something could actually be done instead of just talked to death all the time. If I was crazy, I'd be a conservative too wrote: "... if you believe in term limits, two terms is enough. ..."
Oh, yeah. Republicans voted against term limits on a voice vote. Too bad about all the voters who trusted them. Good riddance, you weakling. You'll end up as an insurance company lobbyist. No surprise he wouldn't get win anyway. The people are feed up with the amssaive debt due to Obama wonderful changes. I hope the Republican Party puts a ton of money into Dan Coats (Lobbyist – GoldmanSachs, UnitedHeath, Bank of America, PHrMA, etc). With those credentials, he'll fit rght into this administration!